The well-equipped cottage has a living room with dining area, a kitchen, three bedrooms and two bathrooms and can be used by up to 6 people. All rooms are equipped with ceiling fans. Outside there are two furnished, covered terraces and a brick barbecue. Two beach chairs with cushions and a hammock invite you to relax. You have unrestricted access and rent the entire house. The property is surrounded by a wall with a large gate. The garden has been lovingly decorated with many flowers, plants and trees (ia. Avocado, papaya, jackfruit, banana, mango, ambarella, lime, star fruit and cinnamon). The airport is about 100 km from the house. Airport transfer is offered in addition, but is not included in the rent. Our local property manager named Victor speaks German and takes care of all your local needs. He owns a minibus, as well as a Tuk Tuk and shows you the dreamlike environment in day trips or multi-day round trips. These can be booked directly with Victor. Upon order, Victor's wife Mallika cooks rice with curry for you and prepares delicious salads. In the morning and in the evening, a tuk tuk drives through the village and delivers bread and other baked goods. The nearest major town, Aluthgama, is 3.5 km away and is easily accessible on foot, bus or tuk tuk. The hotel "Ypsilon" is 200 meters away and has a restaurant right on the beach. The hotel's own beach section with beach chairs can be used free of charge. However, it is expected that drinks and a snack will be eaten. Worth seeing is the temple complex Kande Vihara in Aluthgama. You can also take a 2 to 3 hour boat trip on the Bentota River and through the mangroves. There is a turtle farm 15 km away. On the way to Galle is a very old temple complex in which the history of Buddha is depicted. The hotel "Ypsilon" is 200 meters away and has a restaurant right on the beach. The hotel's own beach section with beach chairs can be used free of charge. However, it is expected that drinks and a snack will be eaten. some excursions in the vicinity: worth seeing is the large mountain Buddha in Aluthgama. You can also take a 2 to 3 hour boat trip on the Bentota River and through the mangroves. There is a turtle farm 15 km away. On the way to Galle, you can see the impressive Morakola Ganagarama Temple, which depicts the Buddha's story. Wir haben uns dort sehr wohl gefühlt.Die Lage und die Betreuung waren ausgezeichnet. 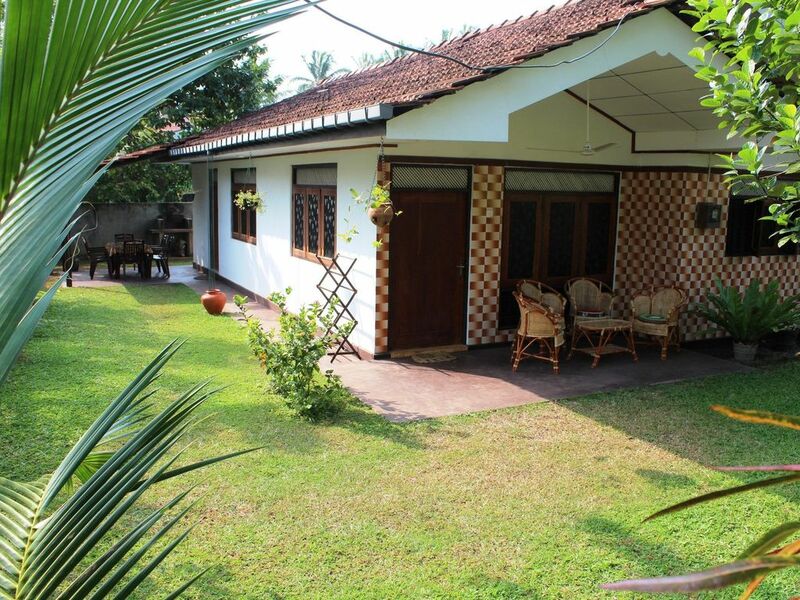 The property is located in the Western Province of Sri Lanka in Moragalla / Godalla between the cities of Beruwala and Aluthgama. The house is a well-equipped house. The property is bounded by a wall with a large gate. The garden has been lovingly decorated with many flowers, plants and trees (ia. Avocado, papaya, jackfruit, banana, mango, ambarella, lime, star fruit and cinnamon). The house has a living room with dining area, a kitchen, three bedrooms and two bathrooms and can be used by up to 6 people. Outside there are two furnished, covered terraces and a brick barbecue. Two beach chairs with cushions and a hammock invite you to relax. The airport is about 100 km from the house. Airport transfer is offered in addition, but is not included in the rent. Our local property manager named Victor speaks German and takes care of all your local needs. He owns a minibus as well as a tuk tuk and likes to show you the dreamlike surroundings in day trips or multi-day tours. These can be booked with Victor. Upon order, Victor's wife Mallika cooks rice with curry for you and prepares delicious salads. In the morning and in the evening, a tuk tuk drives through the village and delivers bread and other baked goods. The nearest major town, Aluthgama, is 3.5 km away and is easily accessible on foot, bus or tuk tuk.